Ready for some fun Kentucky Derby facts? Today we go over all you need to know about Churchill Downs and the 2019 Kentucky Derby. Did you know that the Kentucky Derby is the longest running annual sports event in North America? Established in 1875, the Kentucky Derby has served as a staple for horse racing fans from all around the world. 2019 will be not different. Furthermore, the Kentucky Derby is rich with American history. Here are 3 facts you may not have known about the Kentucky Derby. Back in the 2010, Disney created a movie called Secretariat. The movie was based on the true story of the thoroughbred Secretariat. Secretariat won the Kentucky Derby back in 1973 in impressive fashion. 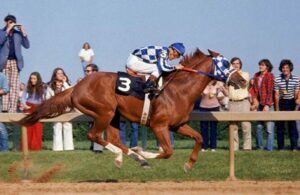 Not only did Secretariat set the record for 1 ¼ miles at The Kentucky Derby, Secretariat still holds the 1 ¼ mile record of 1 minute 59 and 2/5th’s of a second to this very day. Talk about standing the test of time. That includes all of the daily races, Breeders Cups and other special events held at Churchill Downs over the years. Did you know that in 1999, current US President Donald Trump was in attendance at the Kentucky Derby? Trump, who won the US Presidential Election in upset fashion, took the future First Lady Melania Knauss on a date to the 1999 Kentucky Derby. Will Trump attend the 145th Derby? In 1891, the Kentucky Derby was a 1.5-mile course. In the 17th running of the Kentucky Derby, there were only 4 horses competing for the championship. Legend has it that all 4 trainers instructed all 4 jockeys to stay off of the lead until the final stretch. This resulted in Kingman winning the 1891 Kentucky Derby in a final time of 2 minutes 52 and ¼ seconds. Kingman went off at 1:2 betting odds and his owner, trainer and jockey received the first-place purse of $4,550 for their efforts at the track.